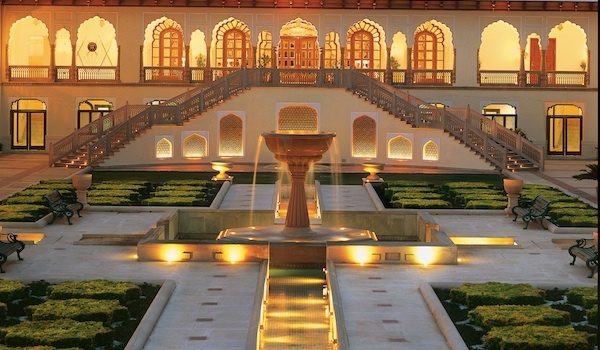 Visitors to India shouldn’t miss the opportunity to stay in an exquisite palace hotel. Across the subcontinent, a number of historic palaces, boasting incredible ancient architecture, coupled with opulent décor and luxurious amenities, have been converted into one-of-a-kind landmark hotels. From sumptuous furnishings to sweeping gardens, these eight palace hotels in India will leave you feeling like royalty. The Taj Falaknuma Palace Hotel in Hyderabad provides a lofty vantage point overlooking the city sights. The view isn’t the only attraction, however. Previously home to Nizam monarchs, the palace has also hosted European royalty and heads of state. Expect sheer opulence from the “Mirror of the Sky,” from crystal-dripping chandeliers to rare artefacts and the Royal Jiva Spa. 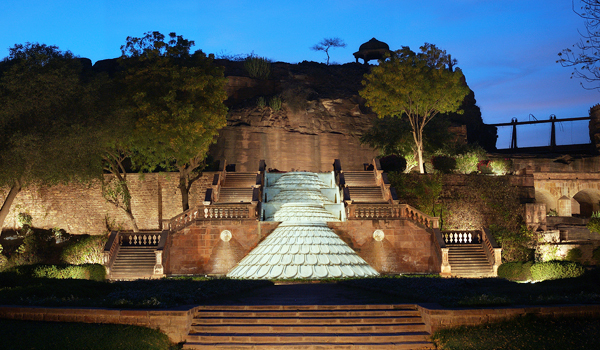 Located outside of Jaipur, Samode Palace dates back to the 16th century, when it was constructed as an imposing fort. Converted into a palace by the city’s Maharaja in the early 19th century, the striking structure is a phenomenal example of Rajput and Mughal traditional architecture. The hotel’s suites and rooms are clustered around its many bougainvillea-filled courtyards, giving the palace a magical ambiance. This sumptuous palace, one of the world’s largest residences, hosts 347 rooms and is still partially occupied by the Maharaja of Jodhpur. 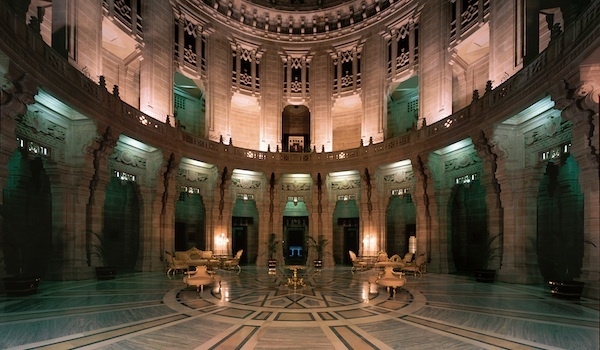 You’ll feel like royalty yourself whilst staying in the hotel portion of the landmark. Set on the highest point in the Rajasthani city, the palace hosts 26 acres of lush, ornamental gardens, a crowning cupola, and Art Deco-styled suites. This distinctive, red sandstone palace, built under Rathore rule in Jodhpur, is set right on the banks of the Bal Samand Lake. Comprising just 10 palace suites and 26 lakeside rooms, the hotel guarantees guests privacy and comfort in the luxurious facilities. Amenities include personal croquet courts, 60 acres of pomegranate orchards, horse safaris, and even an astrologer on-call. 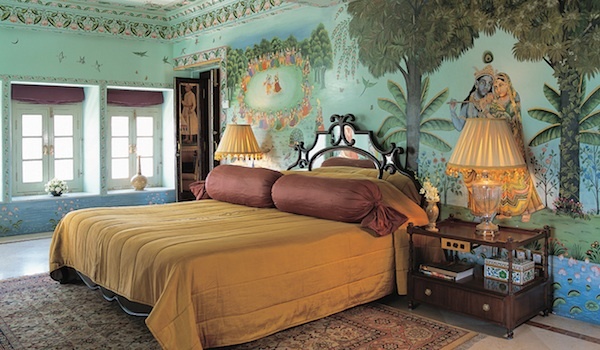 The likes of Prince Charles and Jacqueline Kennedy have stayed at the Taj Rambagh Palace, known as “the jewel of Jaipur,” and it’s not hard to see why. Guests can indulge in a truly regal lifestyle at this stunning palace hotel, which offers polo grounds, beautiful gardens, incredible Mughal-inspired architecture, and even elephants that can be ridden around the premises. Book the Peacock Suite and wake up to views out over the Mughal Terrace. 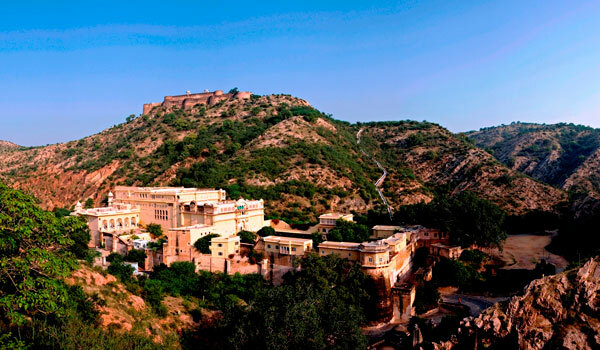 Partially occupied by the family of the Rawat Nahar Singh, this sun-coloured fort in the Aravali hills, poised between Jodhpur and Udaipur, offers renovated hotel rooms that date back to 1670. Also on offer are a solar-heated swimming pool, Ayurvedic spa, and innumerable rooftop terraces that make for gorgeous day-to-nighttime lounging. Voted one of the world’s most romantic hotels, the stunning, white marble-constructed Taj Lake Palace is a sight to behold. Floating on an island in the middle of Lake Pichola in Udaipur, the hotel operates speedboats to transport guests to and from the premises. The luminous palace, once used as a film location for a James Bond movie, features rooms dressed up in the most ornate period furnishings. 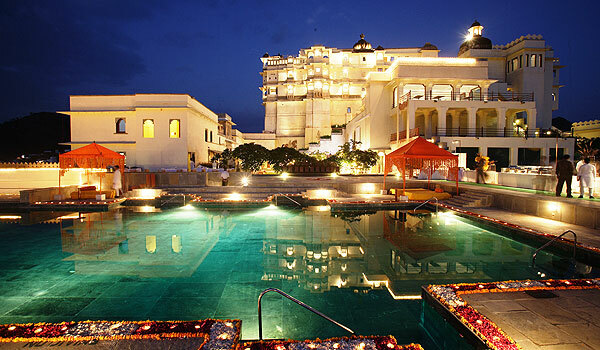 A royal residence for rulers of the Delwara principality until the 20th century, Udaipur’s Devi Garh Palace is one of the most unique hotels on the Indian subcontinent. The heritage hotel in the Aravali hills boasts opulent suites decorated with semi-precious stones and a black marble swimming pool; Devi Garh also offers an on-site Ayurvedic retreat.